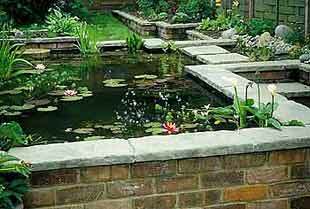 INFORMAL POOLS: An existing pond was brought to life with lush planting, darting fish and a filtration system to keep the water fresh and reflective. The deck provides a great view of the shoals of golden orfe & koi. 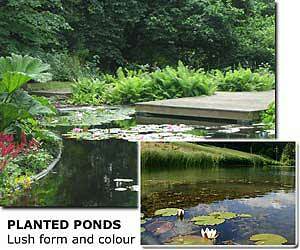 WILDLIFE PONDS (inset): Careful selection of plants in and around this clay-lined lake made the very best use of British native varieties. These stabilise the bank, attract wildlife, maintain water quality and add structure and colour. KOI POND: A focal point of a complete garden makeover, this partly-raised state of the art koi pond (30,000 litres/6,500 gallons) is over two metres deep. Cotswold walling matches the rest of the property. The stainless steel cascade (lit at night) and semi-formal outline are softened by marginals and waterlilies which have been carefully protected from the attentions of the fish. The robust structure has a rubber liner sandwiched in concrete, with base and side drains, surface skimming, and auto-top-up. It is filtered by a remotely sited ‘SuperBead’ unit with fully automatic backwash, and an Oase self-cleaning BitronEco UV unit. We worked with the customer and their builders to create this pool from initial design through to completion. All pumps, filters and top-up facilities are concealed. 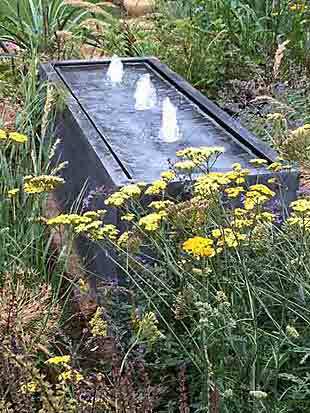 BESPOKE WATER FEATURES: We have designed unique items for our customer’s gardens - such as this self-contained brimming trough with its constantly moving jets generating soothing sounds. The heavy-duty metalwork is welded to size, with a carefully created finish that looks almost like lead. 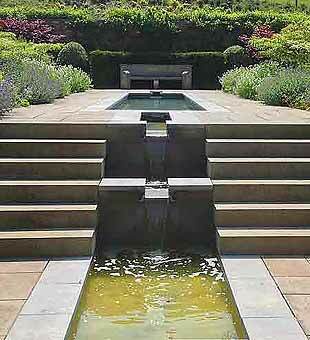 In other gardens we have fitted bespoke bridges, water spouts, and troughs, all purpose built to suit the site. 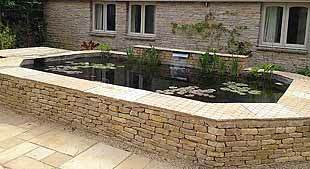 RILLS: Rills are popular in both formal and semi-formal settings, period and contemporary, and create bold lines of reflective water in the landscape.